programme with effect from March 2017.
in corporate organisations and public institutions. starting from March to November every year. selected from the University and UPTA. USA. Investigation Certificate by Niger Delta University, Nigeria. 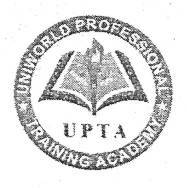 Professional Competency by UPTA, USA. Investigation Professional Certificate by IICF1P, USA. and professional bodies are eligible to apply. months or N300,000 for nine (9) months duration of the programme. Semester and shall receive 1ICFIP Membership Card.